NEW YORK, Jan. 24, 2019 /PRNewswire/ -- S&P Global (NYSE: SPGI) announced today the launch of #ChangePays, a campaign that combines the Company's ability to provide unmatched essential intelligence with a goal to increase awareness of and advance the discussion around the benefits of greater inclusivity. 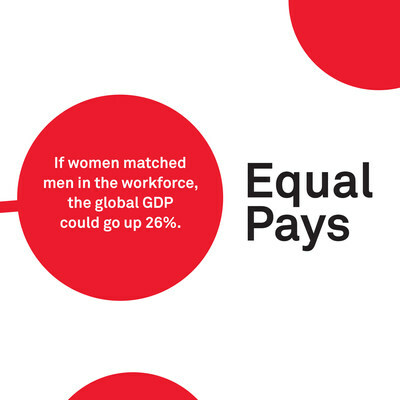 Leveraging S&P Global's data and insights, #ChangePays showcases the positive effects of greater women's participation in the workplace on the financial markets and the possible future economic gains of closing the gender gap. #ChangePays is an element of S&P Global's "Vital Statistics" Corporate Responsibility initiative, one way in which S&P Global is making a difference and powering thriving global communities. "I am thrilled to launch #ChangePays, a first-of-its kind corporate responsibility campaign for S&P Global," said Courtney Geduldig, Executive Vice President, Public Affairs, S&P Global. "Our data and insights make clear that gender equality is an engine for the global workforce and that greater inclusivity leads to healthier, stronger economies. Our campaign will illuminate the positive impact of women in the workplace on companies, organizations, markets, and global communities." "If we know what the data says, we can start working on ways to move the needle and create more opportunities for women," said Douglas L. Peterson, President and Chief Executive Officer, S&P Global. "Women's contributions in the workplace are significant and too often undervalued or underrepresented. Our hope is that #ChangePays will serve as a convening force for action to create a more inclusive economy and promote a more sustainable future. I would invite our employees, investors, clients, and global business leaders to join us in elevating awareness around the benefits of greater workplace inclusivity." Follow us on social media to learn more and join the conversation using #ChangePays: Instagram, Twitter, LinkedIn, Facebook, and YouTube. For more information on #ChangePays and S&P Global's research, please visit www.spglobal.com/changepays. S&P Global is a leading provider of transparent and independent ratings, benchmarks, analytics and data to the capital and commodity markets worldwide. The Company's divisions include S&P Global Ratings, S&P Global Market Intelligence, S&P Dow Jones Indices and S&P Global Platts. S&P Global has approximately 20,000 employees in 31 countries. For more information visit www.spglobal.com.